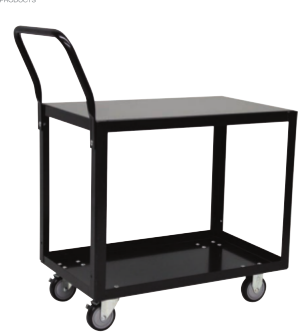 All welded construction (except casters and handle), with durable 14 gauge steel shelves and 12 gauge angle corners. Bolt on casters, 2 swivel & 2 rigid with wheel brakes on swivel casters. 1-1/2” shelf lips down (flush) on top shelf and lips up on bottom shelf. Clearance between shelves - 20”. Top shelf height - 28”.